You are in for a special treat this spring! Abington Choral Club performs in two unforgettable concerts. On Saturday, March 16th at 8:00 PM, we welcome the start of spring as we join the Old York Road Symphony in the performance of Brahms’ Nanie and Beethoven’s Choral Fantasy. This concert will be performed at Abington Junior High School. Click here for more information. 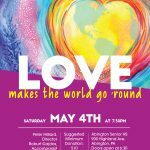 On Saturday, May 4th at 7:30 PM we bring you “Love Makes the World Go ‘Round”, a concert filled with songs about love. Bring friends, bring family – you are sure to find yourself smiling and singing along with us. 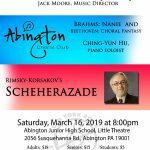 This concert will be performed at Abington Senior High School. Click here for more information.